JavaServer Pages was launched by Sun Microsystems in the year 1999. JavaServer Pages is called as JSP in short. JSP is an expedient technology that enables the developers to build dynamic web pages. Generally, stand alone Java code is embedded within static HTML page to form JSP. Additional JSP tags will be used to specialise the functionality of a web page. Rather than HTML, JSP pages can also be formed from XML or other document types. 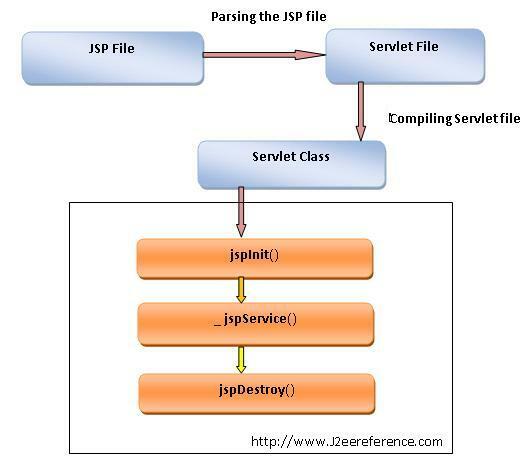 JSP files can be deployed and executed with the help of a web server like tomcat. Almost all the JSP file contains the page directive which gives the information to the JSP engine about the entire source file. Below are the attributes used in the page directives. This specifies the scripting language used in the scriptlets,declarations, expressions in the JSP file. Java is the only allowed value. This will tell the JSP engine about the classes which are to be extended in the particular JSP page. This attribute contains a list of java packages or classes that the JSP should import. More than one package can be imported by using comma separated list. Below packages are implicitly imported in all the JSP page. This attribute specifies whether the client must join as Http session in order to use the JSP page. If the value is true , the session object refers to the current or new session. The default value is true. This attribute specifies the buffer size in kilobytes used by the out object to handle output sent from the compiled JSP page to the client web browser. The default value is 8 kb . If you specify the buffer size,the output is buffered with the size specified . This attribute specifies whether the buffered output should be flushed automatically when the buffer is full. The default value is true. If it is set to true the buffer will be flushed otherwise , an exception will be raised when the buffer overflows. this attribute specifies whether the thread safety is implemented in the JSP file or not. The default value is true.which means the JSP container can send multiple, concurrent client request to the JSP page. This specifies a text string that is incorporated into the compiled JSP page. This can be retrieved using the Servlet.getServletInfo() method. This attribute specifies the pathname to a JSP file to where it has to send the exception. this specifies the whether this JSP file display an error page. If set to true you can use the exception object in the JSP file . The default value is false. The default mime type is text/html and the default character set is ISO-8859-1. JSP declarations are used to declare class variables and methods in a JSP page. They are initialized when the class is initialized. Anything defined in a declaration is available for the whole JSP page. A declaration block is enclosed between the <%! and %> tags. A declaration is not included in the service() method when a JSP is translated to a servlet. What is a JSP expression? A JSP expression is used to write an output without using the out.print statement. It can be said as a shorthand representation for scriptlets. An expression is written between the <%= and %>tags. It is not required to end the expression with a semicolon, as it implicitly adds a semicolon to all the expressions within the expression tags. request.getRequestDispatcher(path): We need to give the relative path of the resource. context.getRequestDispatcher(path): We need to give the absolute path of the resource. How to implement a thread-safe JSP page? JSPs can be made thread-safe by having them implement the SingleThreadModel interface by using <%@ page isThreadSafe=”false” %> directive in the page. Difference between the session and cookie? Sessions are always stored in the server side whereas cookies are always stored in the client side. Difference between <%@include:> and <jsp:include> ? <%@include:> is a directive which statically inserts the file at the time the JSP page is translated into a servlet. <jsp:include> is an action which dynamically inserts the file at the time the page is requested. Difference between forward and sendRedirect ? Both requestDispatcher.forward() and response.sendRedirect() is used to redirect to new url. forward is an internal redirection of user request within the web container to a new URL without the knowledge of the user. The request object and the http headers remain same. But sendRedirect is normally an external redirection of user request outside the web container. sendRedirect sends response header back to the browser with the new URL. The browser send the request to the new URL with fresh http headers. How can we open excel documents from JSP ? How can we open word documents from JSP ? You can use the errorPage attribute of the page directive to handle run-time exceptions which automatically get forwarded to the error page. How to prevent the output of the JSP from being cached by the browser? What are the JSP scripting elements ? How to prevent creating Session in the JSP page ? By default, a JSP page will automatically create a session. How to include static files within a JSP page ? You can include static pages in the JSP page using the below code. This is the JSP Quiz Page. JavaServer Pages are processed by ? What is the signature of method jspInit of JspPage? JavaServer Pages are processed by software on the ? Which one of the following is a valid argument for a JSP page directive? What is the return type of the getLastModified method of HttpServlet? What is the signature of method _jspService of HttpJspPage? When a JSP is executed, of the following, what is most likely to be sent to the client ? What is the signature of method jspDestroy of JspPage? Scriptlets are used to embed any piece of java code into the page. Scrptlets will get executed at the the time of request. while writing expression semicolon cananot be used to end the expression. JSP declarations are uesd to define methods or variables that are to be used in the java code later in the JSP file. The declaration get inserted into main body of the servlet class. It has the following form . This comment can be viewed fromt he page source from the web browser. When a request comes for a JSP, the JSP engine first checks whether it needs to compile the page. If the page has never been compiled, or if the JSP has been modified since it was last compiled, the JSP engine compiles the page. 2) Converting JSP to a servlet. After compiling and loading the JSP page it invokes the jspInit() method before servicing any requests. You can override the jspInit() method if there is any specific need for initializing your JSP. // Your Initialization code here. The jspDestroy() method is the JSP equivalent of the destroy method for servlets. You can Override jspDestroy if you need to perform any cleanup, such as releasing database connections. // Your cleanup code goes here. What is JSP (Java Server Page) ? 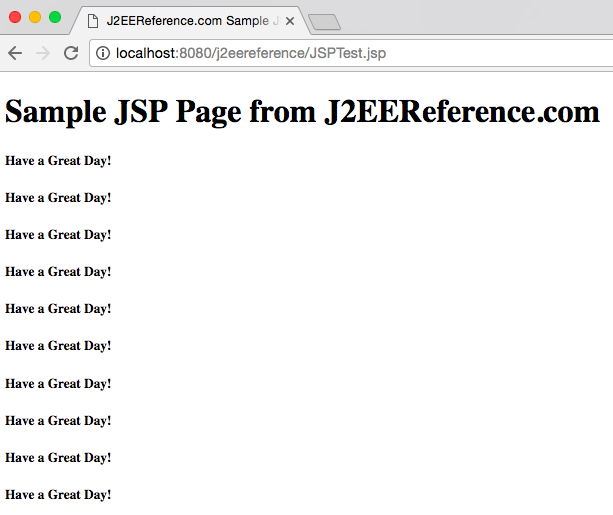 JSP is a standard component of J2EE which is an extension to Servlet to generate dynamic web pages. JSP defines some specialized tags to to embed Java code within HTML. JSP is the combination of Static HTML and Dynamically Generated Content using Java technology. The suffix ends with .jsp to indicate the web server that the file is a JSP file. 1) Effective way for generating dynamic HTML. 2) JSPs automatically get compiled to servlets and execute on the Web Server. 3) JSP compilation happens only if there is any change in the JSP source. 4) JSP is faster and easier for editing. 6) Write Once run anywhere.